We’re happy to report that our inaugural fundraiser for the Student Docent program was a rip-roaring success. Over 60 people joined us at Old Main for a few hours of food, drink and camaraderie. 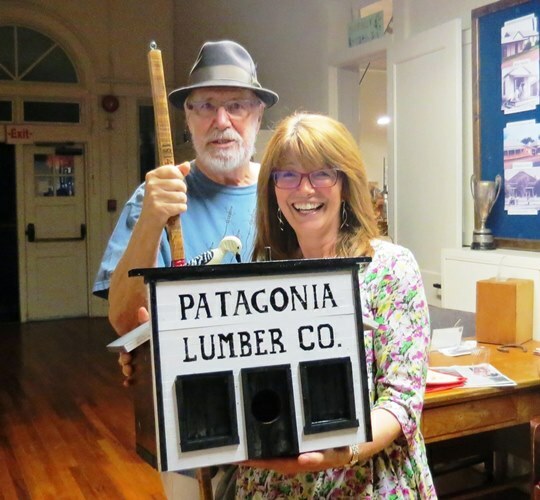 Congrats to Valerie Neale and Rick Jones (pictured) who won the birdhouse version of the Patagonia Lumber Co.
We appreciate you supporting THE PATAGONIA MUSEUM’s mission of collecting and preserving the culture and history of Eastern Santa Cruz county. To become a member, you can join online via PayPal or print the membership form to send us a check.